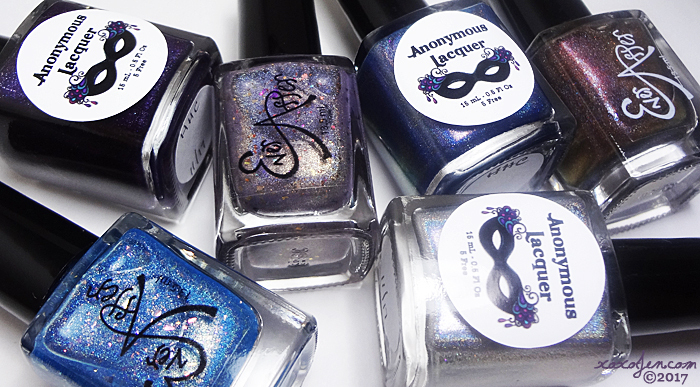 Hella Holo Customs featured guests for November are Ever After and Anonymous Lacquer. They've made beautiful polishes which are available now through December 4th to HHC Members only. I See The Light - a sky blue holo with pink, orange, and gold shifting flakes and gold sparkle. The flakies in this are everything! Difficult to capture fully on camera but super flashy and amazing in person. Two coats with topcoat shown. Such a beautifully done shade, perfect for any time of year and office appropriate. Two coats with topcoat shown. 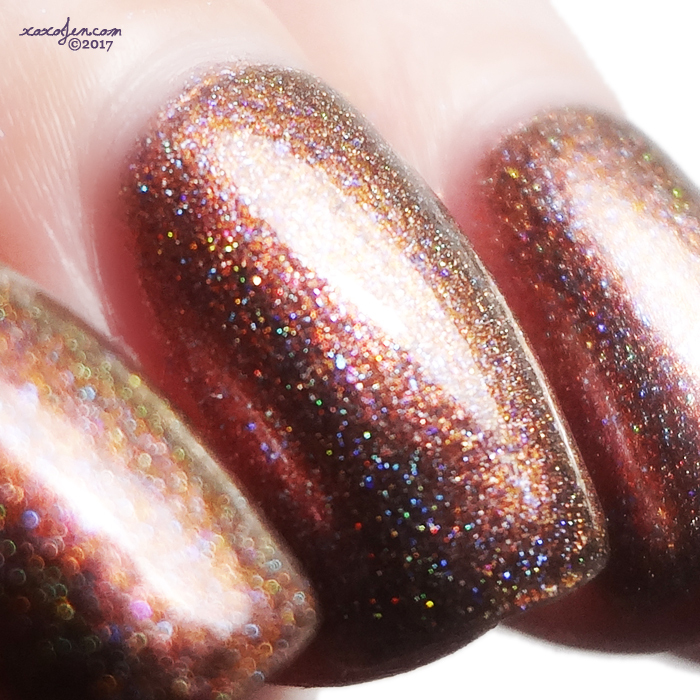 Tinman's Kiss - a bronze to copper multichrome holo with purple flakes and blue shimmer. I'm still wearing this one and I keep wanting to do a dry brush over it with turquoise and maybe some stamping in another color. Such a pretty shade! Two coats with topcoat shown. One coater ya'll! Yup, just one coat with topcoat here, super stunningly rich and deep. Perfectly named! Harley Daze - silver ultra linear holo. 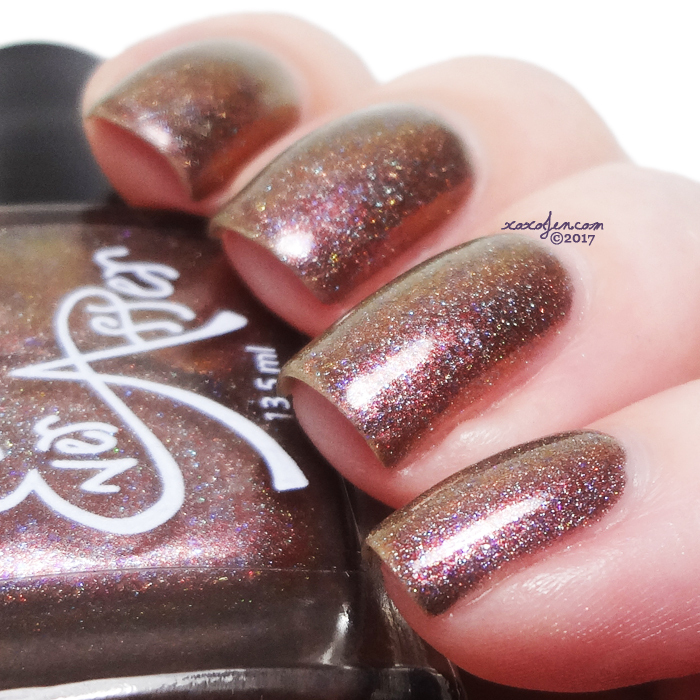 Mildred added purple shifting pigment to amp up the holo effect. Loving the touch of purple in this, makes it more unique than other silver holo polishes. Two coats with topcoat shown. Twilight's Dawn - blue with a red shift linear holo and added red shifting pigment to add some extra sparkle to the shift. This one made me happy when I first saw the bottle. It reminded me of days past when I played with blue and bright orange playdoh. It was so hard to capture on camera but this totally has that neon-ish looking orange shift and shimmer in it. Blue lovers need this! Two coats with topcoat shown. All six HHC polishes are absolutely beautiful and it's good to see Anonymous and Ever After back again. 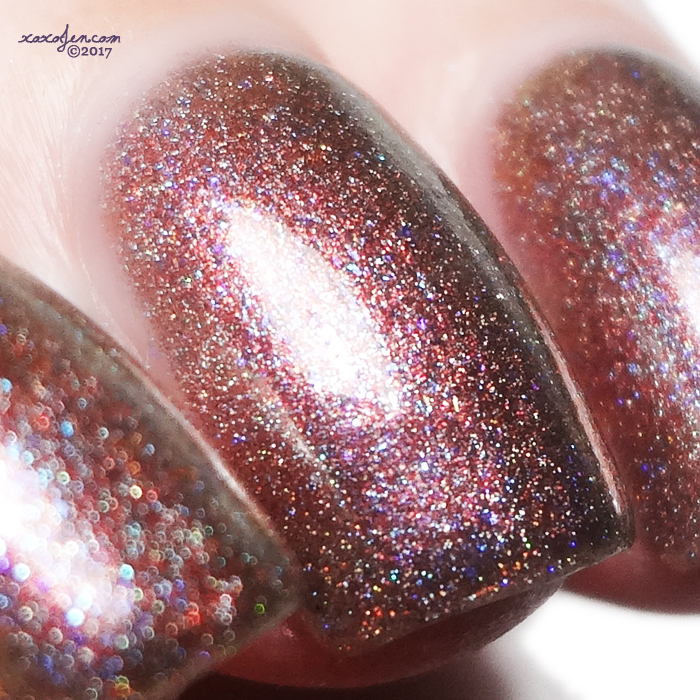 My favorites in this collection are Deep Secret because of its deep rich shade that's still holo and a one coater and I See the Light for it's stunning flakes - I need all the colors in this finish. It's simply beautiful! The colors are fantastic in here! Just a couple of questions. I've read everything, but I'm still confused, probably because of all the acronyms that I don't understand. How do I find out the prices of the polishes? Are you the one selling These? Or not? How do I find out who's selling these? of course I can help ya out! You'll need to join the linked group to find the purchasing details. These are members only polishes. Everyone is welcome to join, it's not an exclusive club or anything. :D Once you've joined, look for the sales post, it is usually near the top of the feed.